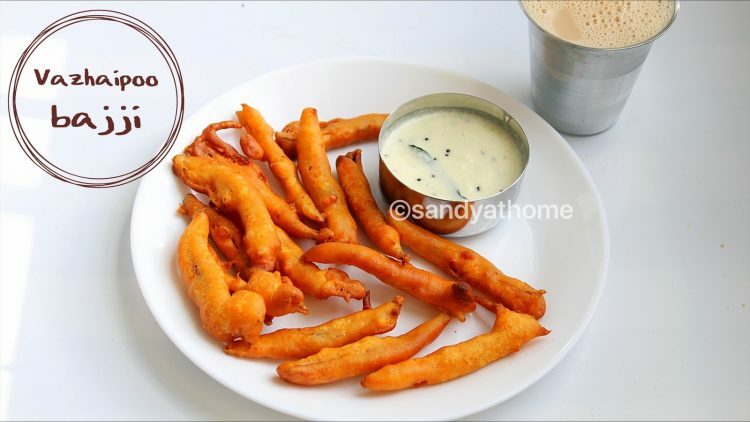 Vazhaipoo bajji/ Banana flower bajji is a yummy and interesting deep fried snack with lot of health benefits. 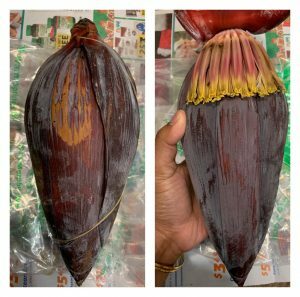 Vazhai poo/ Banana flower is loaded with antioxidants, cures digestive problems, prevents anemia, good for nursing mothers and many more goodness as it is loaded with fiber, potassium, iron, magnesium and more. So adding it to our diet in the form of poriyal/ stir fry, vadai, bajji, rice, kootu or any delicious dish yields lot of goodness to us. Many people don’t eat this banana flower just because of its taste but this bajji made with banana flower is so delicious that no can find out the flower’s taste nor aroma in it and surely will become its fan. I know cleaning this flower is TDS job but once in a while its okay to do in order to get your health right. So try this new variety bajji and surprise your family members and friends. So let’s get to the making! Open the banana flower leaves one by one inside it you will find a batch of banana flowers which are edible. Now remove it gently from the banana blossom. Now pull the feathery plastic like petal back. Discard this feathery plastic petal as it is not edible. Now look for the matchstick like stem inside the flower and remove it as well. Discard this one too as it tastes bitter. 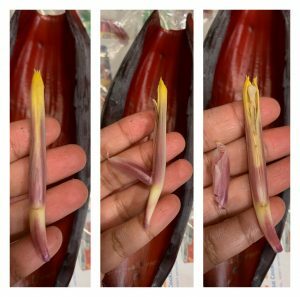 Now repeat the process for each banana flower till you see tiny white part which can be eaten raw. Heat oil in a frying pan. In a bowl add besan, rice flour, chili powder and salt. 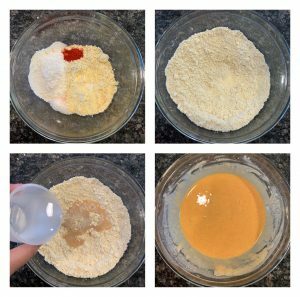 Mix well, add water gradually to form a thick batter( I used around ¾ cup water). 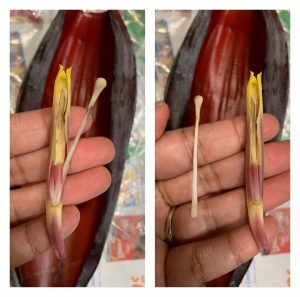 Wash the banana flower and dry it using a tissue or cloth. Water droplets in the leaves can make the the bajji pop in oil while frying. Dip each banana flower one by one in besan batter coated well and drop it in preheated oil. 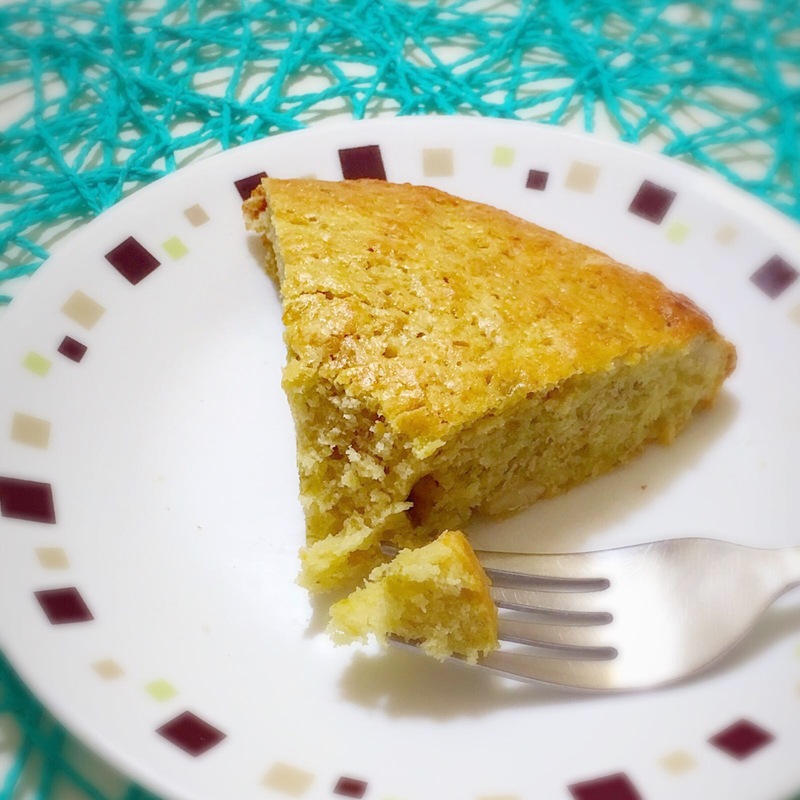 Repeat the process until you finish the batter and all the banana flower is over. 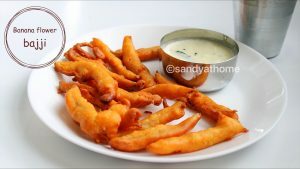 Flip the bajji after it has puffed. When both sides are cooked remove from oil and transfer it to a plate and serve it hot with green chutney and masala chai! Wash the banana flower and dry it using a tissue or cloth. 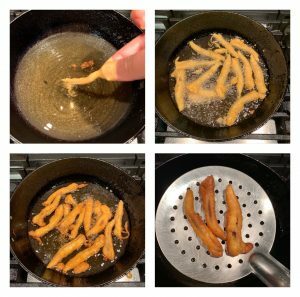 Water droplets in the leaves can make the the bajji pop in oil while frying. Dip each banana flower one by one in besan batter coated well and drop it in preheated oil. Repeat the process until you finish the batter and all the banana flower is over. 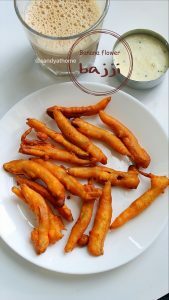 Flip the bajji after it has puffed. When both sides are cooked remove from oil and transfer it to a plate and serve it hot with chutney and masala chai! Make the batter thick which will help batter coat well on to the banana flowers well.. 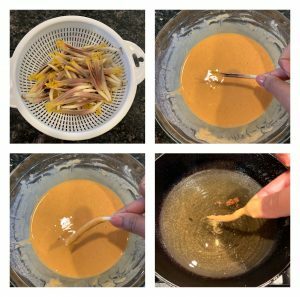 The batter from the banana flower slides very quick so drop it quickly in oil and carefully.